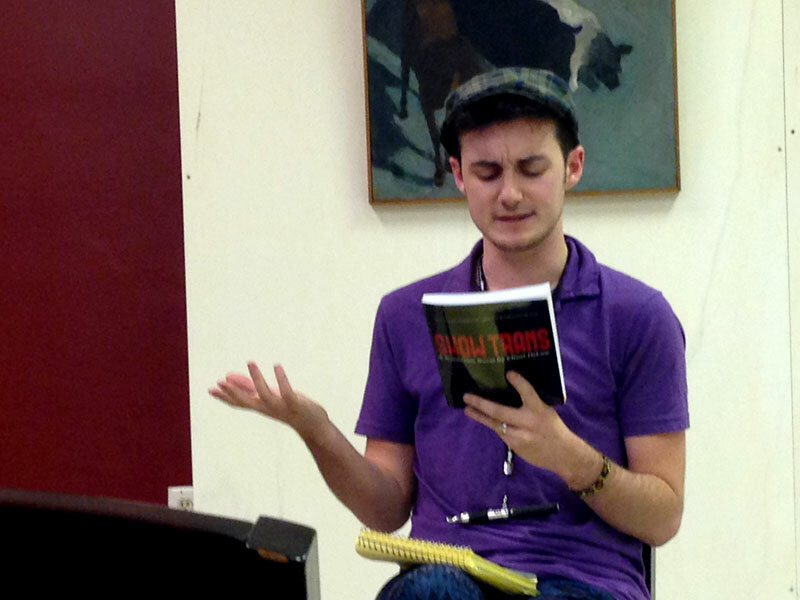 Syracuse-based author Elliott DeLine read excerpts from Show Trans on Oct. 15 at Buffalo Street Books in downtown Ithaca. The novel chronicles a difficult period of DeLine’s journey with sexuality when he transitioned from female to male nearly five years ago. Show Trans, DeLine’s latest book, will be available on Amazon for Kindle download on Oct. 31. A paperback copy of the book, which the author self-published, was released Oct. 1. In the book, he addresses the difficulty of being a transperson in Central New York, including limited access to hormones and adequate health care, and said he wants other transgender people to feel a part of a larger community. “I want them to take away whatever they personally need to take away from it. I hope it makes other people going through similar experiences feel less alone,” DeLine said. A 2011 UCLA study says that approximately 700,000 Americans identify as transgender. No current governmental statistics exist because the U.S. Census Bureau does not offer citizens the option to identify as transgender on the decennial survey. Maureen Kelly, vice president for programming and communications at Planned Parenthood of the Southern Finger Lakes said research in 2009 revealed a definitive absence of care and resources available to transgender people. In 2009, Kelly founded Out for Health, a program that provides outreach to LGBT people, their health care providers and the community at large. The program commissioned research to understand the challenges LGBT individuals face in the Ithaca area. DeLine echoed Out for Health’s commission results. On Oct. 20, The Advocate, a gay news, LGBT rights, politics and entertainment magazine, published an opinion editorial by Kelly commending Ithaca, New York, as a “haven” for transgender people. Kelly noted in her editorial that the transgender preventative care and hormone program opened in winter 2013, offering healthcare, information, hormones and support for transpeople in the area. Additionally, Out for Health currently provides medical appointments, family planning, STD information and youth groups to citizens of Ithaca, Elmira, Corning, Hornell and Watkins Glen. Although there has been an increase in support services, Jason Hungerford, a board member of the Ithaca LGBT Task Force, said the area still lacks a definitive health care for the trans community. The task force was founded in the 1980s to advocate on behalf of the LGBT community for non-discrimination laws in Tompkins County and the City of Ithaca. In October 2013, the task force moved to an inactive status, responding to other programs that had begun serving the community. However, Hungerford also noted the fairness and inclusion gays and lesbians have benefited from still has not fully reached the trans community. DeLine hopes sharing his story will encourage readers to build a stronger understanding of the trans community’s struggles. Click here to view a video interview with author Elliott DeLine. The red siding appears worn, and its the interior is dominated by warm chestnut wood paneling and Cornell Red paint. There are clusters of red-topped tables and a bulletin board overwhelmed by flashy flyers. The flyers promote Speed Friending, Spa Night and one reads “Show Us Your Muscle,” with tearaway info tabs on the bottom. It’s twelve steps up to the half-moon landing, which overlooks the tables and faces the window-paneled double door entrance. Cash register keys click and dishes clank together, blending into moments of chatter and laughter. Following a series of renovations that shut the Barn down this past summer, the venue continues to expand its popularity, regularly hosting both campus and community events on the East Hill. There are already 30 events on the books for the next month. Corda said there were more events from 2013-2014 compared to 2012-2013, but the total may not greatly increase, because the Barn could not hold events from July 1 through Aug. 15 this year. The number of total events hosted in the Barn has increased from 229 in 2001-2002, to 636 in 2012-2013, averaging one to two events per day. Runjini Raman, a student employee at the Big Red Barn, said the increase of event is due to an increased number of campus groups and labs hosting events there. Corda said she’s proud of the Barn. Physics student Kayla Crosbie attends the weekly grad gathering, but has also taken Tango classes at the Barn. She said the draw for her, and most grad students, on Friday night is the $1 beer. Alan Kwan, a graduate finance student said the Friday night festivities are what bring different groups together. “A lot of my friends are in Johnson [Graduate School of Management], but through classes and random happenstance, I meet people from all over,” Kwan said. Click the slide above to view a slideshow of the Big Red Barn and hear grad students at Cornell share their experiences with the venue. To secure its longevity, the Barn has recently undergone a series of renovations that were necessary to keep the Barn safe for student use. In 2007, a beam from the Barn’s ceiling came apart and required construction from November 2007 to March 2008. This past the summer, the Barn was expanded to increase the capacity of students and add some office space. Though most building improvements are not visible, Corda said the changes were considered a cultural reinforcement project. 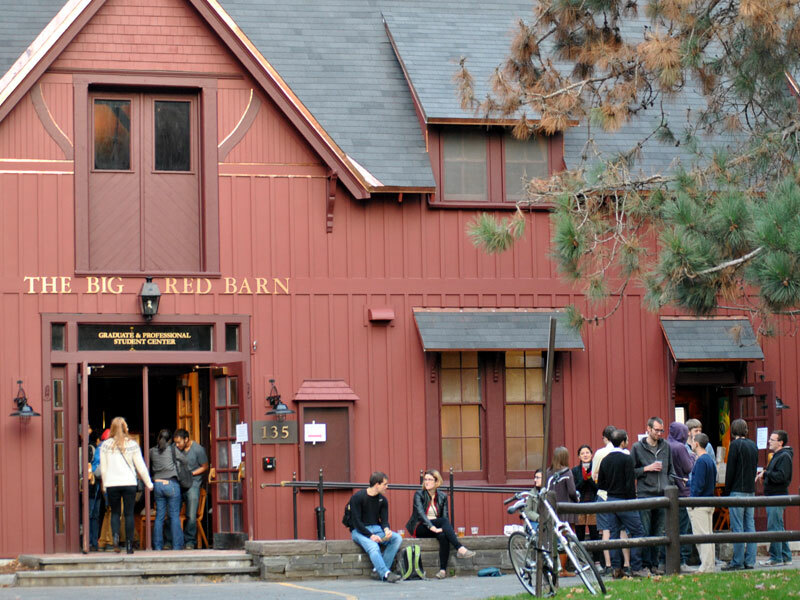 The Big Red Barn, which was built in 1870 to house Cornell’s first president, Andrew Dickinson White, has been a gathering place on Cornell University’s campus since the 1950s. An old carriage house featuring a large brick patio, and surrounded by grassy fields, the Big Red Barn is flooded with graduate students on Friday evenings. Tell Grads It’s Friday, a grad-students-only gathering held from 4:30 to 7 p.m., is just one of many events hosted at the Barn each week. Fifth year graduate student Nate Van Zee said the Barn also provides a haven for graduate students to interact more exclusively with their peers. Though there is no current plan to expand the Barn beyond what it can host right now, Cordo said there are always ideas to improve the Barn. For a slideshow of the Big Red Barn, click here.